food, fabric, and fiber – all things made by me, Tray-Tray! You are currently browsing the category archive for the ‘food magazine obsession’ category. 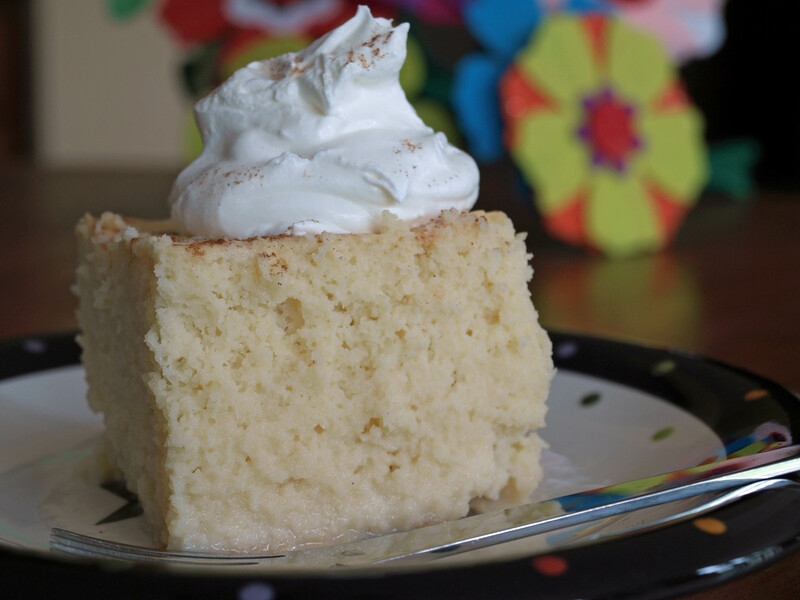 In celebration of Cinco de Mayo this week I decided to make a tres leches Cake. This also satisfies my (self-imposed) rule to make 2 recipes out of each food magazine I subscribe to, so it’s a win for everyone. A few years ago I was watching the Martha Stewart Show. She had some woman on who was going to make a lighter version of a tres leches cake. I can get behind this since I often try to adapt recipes to make them slightly less unhealthy. I’m not trying to fool anyone but my husband, who will only try certain foods if he believes them to be light – weirdo. She used a reduced fat milk, fat-free evaporated skim milk and fat-free sweetened condensed milk. So, in the spirit of the lighter tres leches cake she put Cool Whip on the cake. Martha was appalled. She would never use Cool Whip in her kitchen. How gouache. You would have thought the woman smuggled in some imitation vanilla extract (gasp!). After the tongue lashing, Martha actually started whipping her own cream to put on top of her cake. It was ridiculous. Don’t get me wrong, I actually adore Martha Stewart, but sometimes the way she belittles her guests grates on me. So now, tres leches will always remind me of her, and not some trip to Mexico I’ve taken or a memorable meal at a restaurant. Thanks Martha! 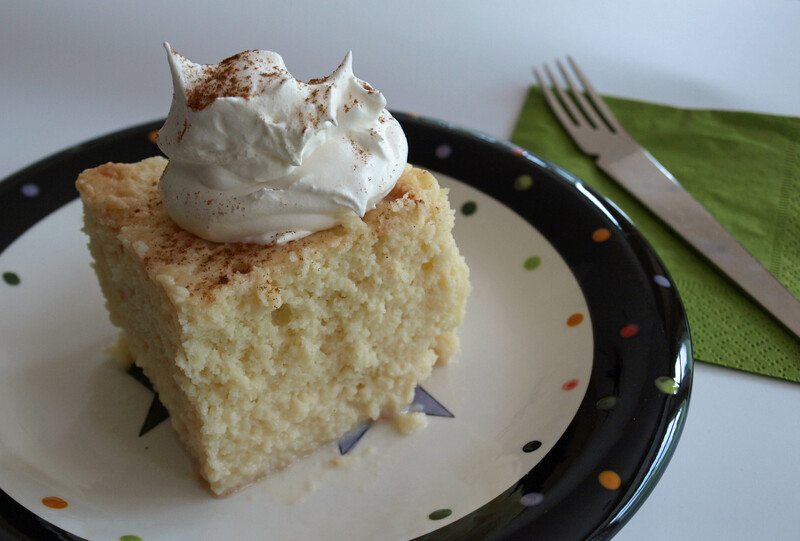 Lately recipes for a tres leches cake have shown up in a lot of the magazines I receive. And, the cake has been popping up on several restaurant menus. This makes me think tres leches cake is destined to be the new red velvet and since I am one to always follow trends (rather than start them!) I had to make one. And, as an homage to that poor woman on the Martha Stewart Show, I was going to use Cool Whip. you can actually see how moist (wet) this cake is! I adapted a recipe from the May issue of the Food Network Magazine by using fat-free evaporated skim milk and fat-free sweetened condensed milk. I did use the whole milk it called for mainly because I like to have whole milk in the house. It’s so good in coffee. You could use a reduced fat milk, I’m sure, though I wouldn’t use skim. The cake came together beautifully and smelled wonderful while baking. After it bakes you need to pour 2 cups of milk, a can of evaporated milk and a can of sweetened condensed milk. This was a lot of liquid for a 8 inch square cake! I took my time and made sure each drop was absorbed before I started pouring more. I was worried it would flood out of the pan! My husband and I loved this cake but our 9-year-old thought it was too “wet”. When Dan corrected her and told her she meant moist, she corrected him and said “no, I mean wet!”. She was right – it was very wet, but we loved it. I’d definitely make it again, with the lighter modifications, as an ending to a Mexican themed dinner party. It’d be delicious after grilled fish tacos. I always need balance after I eat something as healthy as grilled fish! Pre-heat the oven to 350 degrees F. Grease an 8-inch square baking pan with vegetable oil and line the bottom with parchment paper. 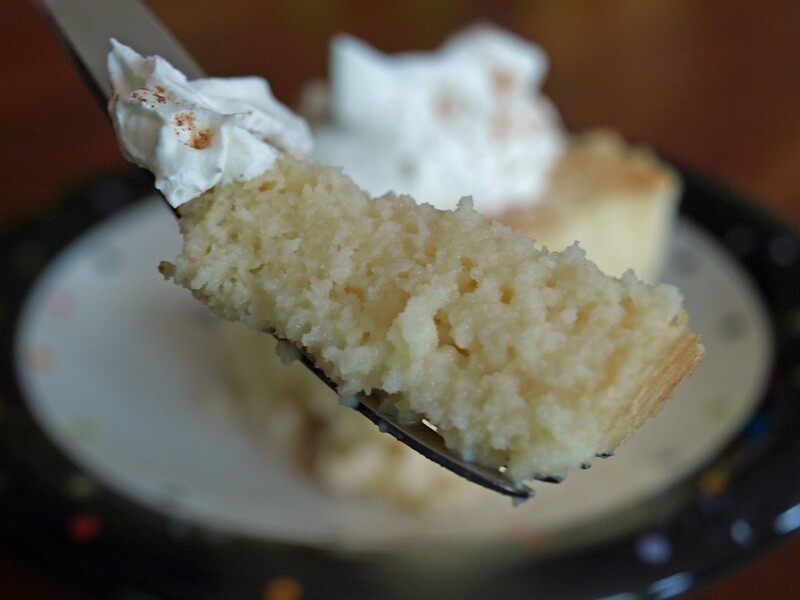 Make the cake: Beat the eggs and sugar in a large bowl with a mixer until pale and slightly thick, about 6 minutes. Slowly beat in the melted butter, then beat in the vanilla and 1/4 cup whole milk. Whisk the flour, baking powder and salt in a bowl. Sift the flour mixture over the egg mixture, then gently fold together with a rubber spatula to make a thick batter. Transfer the batter to the prepared pan and bake until a toothpick inserted into the center of the cake comes out clean, about 30 minutes. Run a knife along the edges to release the cake from the pan. Meanwhile, whisk the remaining 2 cups whole milk, the evaporated milk, condensed milk and rum in a bowl. Pierce the warm cake all over with a fork, then pour the milk mixture gradually and evenly on top, letting the cake absorb the liquid until all is used. Cover and refrigerate at least 1 hour or overnight. Top each piece with Cool Whip, sprinkle with cinnamon. Enjoy!